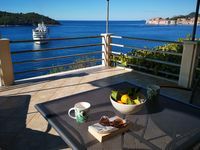 Properties in Dubrovnik-Neretva County average 4.5 out of 5 stars. Property 40: "Home Away From Home"!! Charming apartment just a moment from the sea. 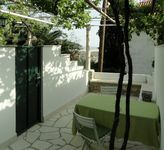 Property 43: Charming apartment just a moment from the sea. We stayed in Blue Infinity for 5 nights and wished it was 15! This wonderful apartment is very new and well done. The pictures do not do justice to the quality. The deck is an amazing space with incredible views. During our stay, there were political leaders visiting Dubrovnik. We were lucky to be staying on this side of the town as traffic was terrible due to security, but from this apartment, the old town is easily accessible by foot. It is in a quiet neighborhood that is just the right distance from the hustle and bustle. The property is gorgeous and has steps that lead down to the water - amazingly tranquil. Our hosts were friendly, incredible and willing to go out of their way to assist us with questions and transportation. We were lucky to have them help us navigate everything related to Dubrovnik as it was our first visit. I look forward to returning to this property in the near future! Very close to the old city. It was clean and very quiet. Owner met us and helped tremendously with parking. They allso suggested two of the best restaurants we ate at while in Croatia. Off season was the best time to visit. Can&rsquo;t wait to go back.